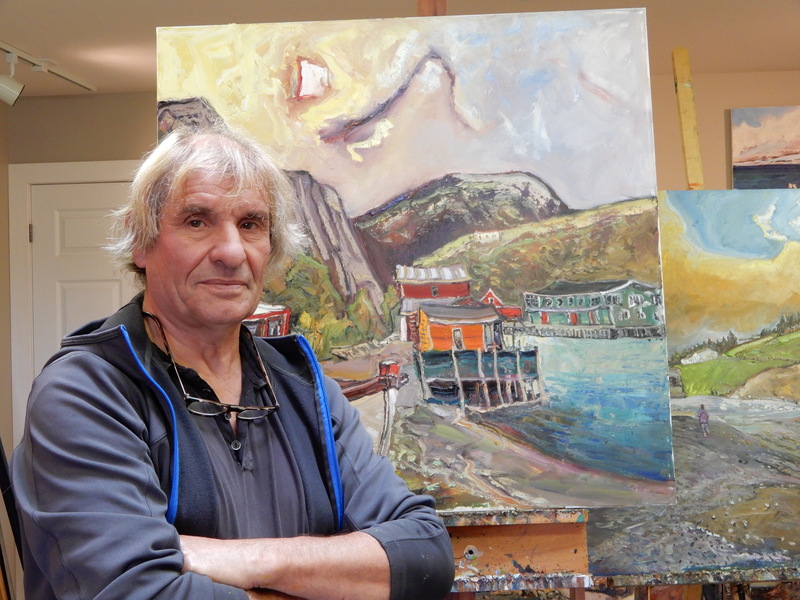 At the edge of Quidi Vidi Village, Jean Claude Roy is painting. Roy has captured this historic fishing harbour on canvas countless times, but never the same way twice. He doesn’t overthink his perspective – his eye naturally finds his desired composition. He paints en plein air, arranging his easel smack dab in the scene, preparing his oil palette by dotting moody hues next to merry ones, mixing as he goes with palette knives, brushes, a rag, and tin can full of mineral spirits. Everything about this man screams outdoorsman and artist – the windblown hairstyle, tanned skin, flecks of oil paint on his black sneakers and blue jeans, but nothing more so than his work. In the foreground of Roy’s painting is a white wooden schooner trimmed in poppy red and nestled on the muted sage green grass and beige and gray stony beach. The beach gives way to aqua and turquoise waters, flanked by the historic orange and red fishing stages to the left and an evergreen Quidi Vidi Brewing Company across the harbour. The vividly coloured scene has a hazy, ethereal quality, as Roy’s thick lines twist and turn, holding your gaze within the square canvas, eyes darting from boat to stage to water to cliff to sky and back again. It’s an expressive version of the real thing, for sure, where the lines are straighter, the colours duller and the overcast sky concealing most evidence of sun. And yet, all of Roy’s landscapes feature sunshine. “I was painting outdoors, I look at the sun too long, had the black dot in my eye, is what it is,” Roy says about his first time painting the sun, sometime in the late 1980s, perhaps earlier. “There’s wishful thinking and then there’s wishful painting,” I say, looking at the sky. 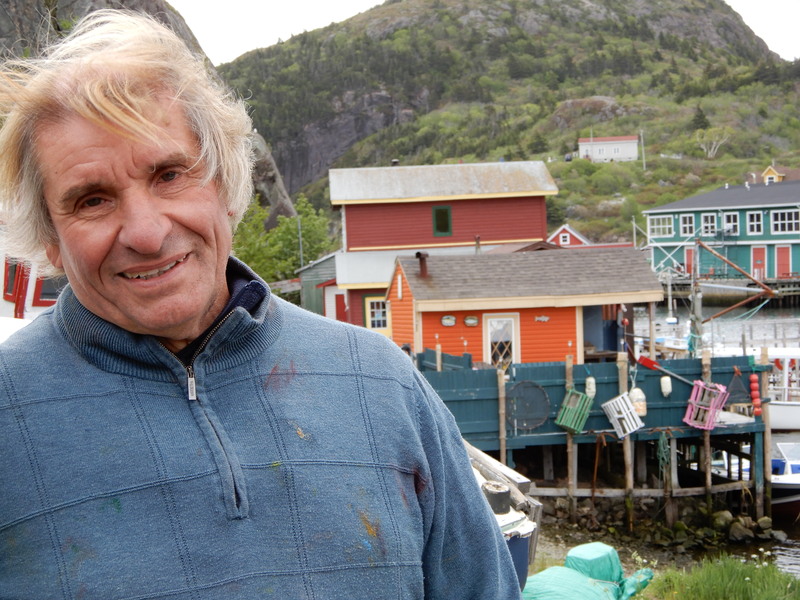 He’s certainly seen Quidi Vidi Village transform. He looks for and loves the bent and broken lines of a wharf that’s been cobbled together, as it was originally, the result of townsfolk hammering whatever wood they had together into a rickety, misshapen landing. New is not necessarily better, he says, uninterested in the straight lines of government wharfs, expensive residential builds, or plastic fishing gear. His eye is trained to find roads dipping and bobbing with the flow of the coastline that nook and cranny into tiny coves and beaches. If mess is what he’s looking for, then he’s arguably come to the right place to find it. All across the province, there are old, historic structures like the ones Roy adores up for sale. The most common sign I spotted this past summer travelling from one edge to another wasn’t for jam or crafts but for real estate. The province’s net migration over the last 25+ years has fluctuated, with a lengthy period of out-migration (1992-2007, when the population declined from 580,109 to 509,055), then a modest increase in in-migration (2008-2015, with the population reaching a high of 525,355), followed by another decline more recently. 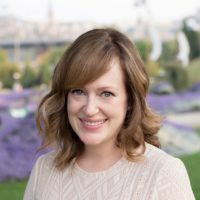 While tourists love to visit in the high season – doubling the province’s population over that period – it seems people come for a good time, not a long time. In 2018, NL was the only province in Canada to see its population decline. 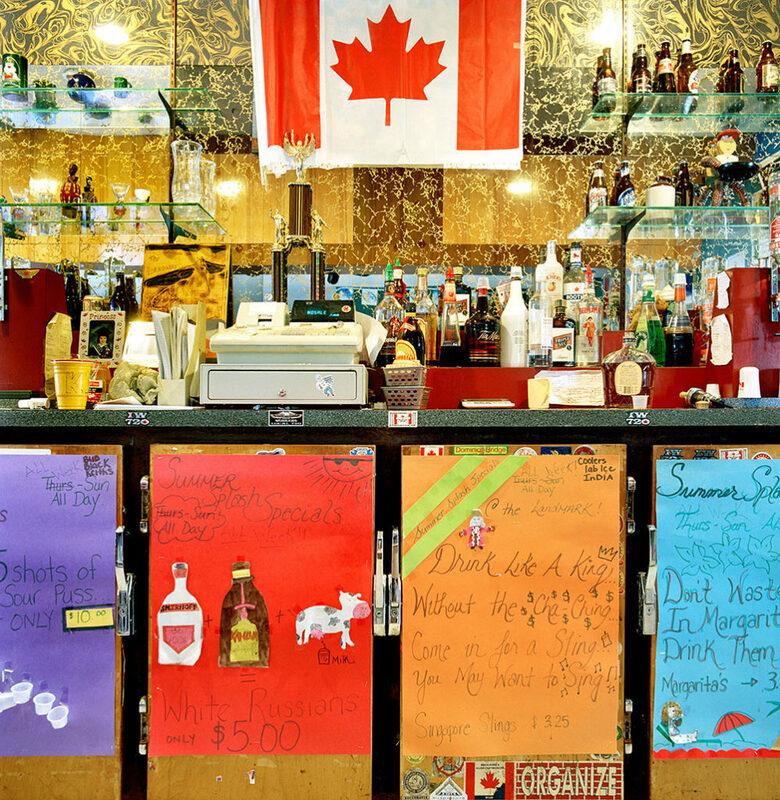 Unemployment reached a high of 20 per cent in 1992, when the cod moratorium brought the single largest mass layoff in Canadian history. While the last 25 years have seen NL’s unemployment rates decrease, the last few years have seen those rates climb back up once again. The most recent data show the unemployment rate trending down (from 14.1 per cent in September 2018 to 11.7 per cent in January 2019, using seasonally adjusted data), but that’s still more than two times the country’s average. But Roy’s sun has shone over his landscape scenes, even as the people in NL’s outports packed up their things and left. Pre-moratorium, commercial fishermen regularly landed between 400,000 to 600,000 tonnes of northern cod annually, but these days catches fall below 20,000 tonnes. A few years ago, marine scientists cautiously predicted a “cod comeback,” but there’s less optimism now. 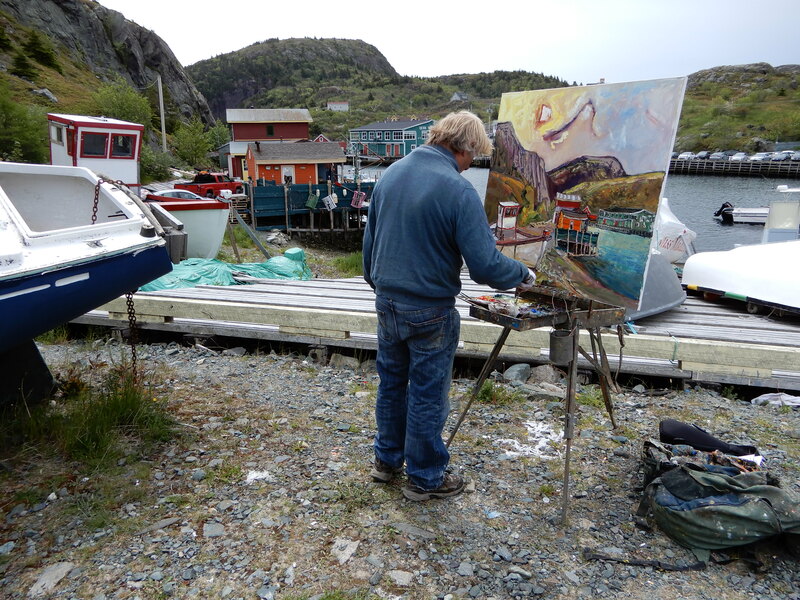 A young boy, his father, and their dog walk by to see what Roy is up to here in Quidi Vidi, but Roy tells me he usually paints in quiet surroundings. With fewer fishers, families, and children, the silence makes it loud and clear how the outports have changed. There are even fewer seagulls, Roy says, the seabirds having abandoned their posts, which no longer promise a fresh meal of fish guts. Behind us, Roy’s minivan, his preferred mode of travel, has the trunk-hatch wide-open. Inside, there’s built-in shelving and storage for transporting multiple large canvases. The middle seats double as a bed, a necessity for an artist on the road: his two books, Fluctuat Nec Mergitur (2011), and Terra Magna (2016), include every community in the province. Each displays Roy’s distinct sun, brightening the canvas. If one thing is sure, every day, the sun will rise on this rock. And while that sun may sometimes be difficult to spot, it seems wherever Roy travels, he finds it.